It has been an interesting year compared to last year. Last year was show after show, traveling, wheeling trips, and non-stop action. This year, by comparison, felt like I was retired and living in Boca. Times are finally changing and we are back in the saddle again. 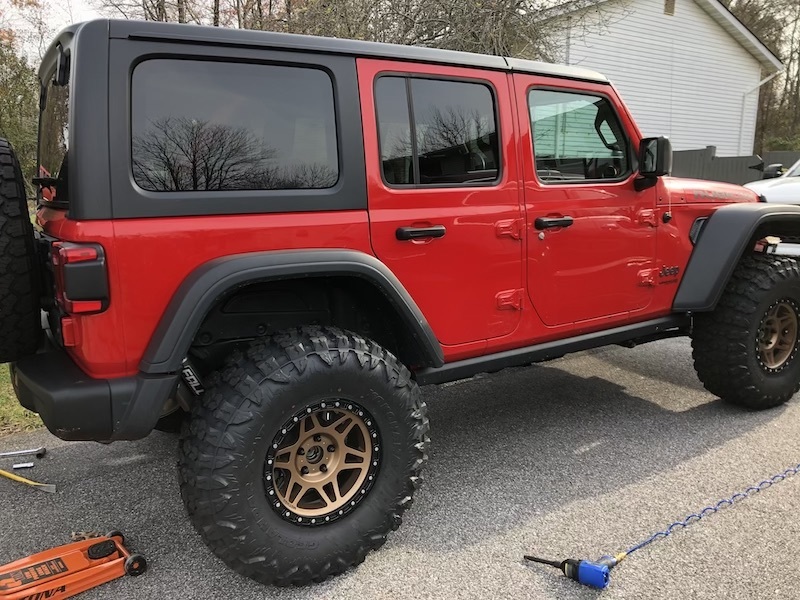 When I picked up the JL in January the goal was to test the factory parts and see if the rumors of running 35’s on a stock JL Rubicon was possible. It definitely is. Would the stock tire carrier carry a 35-inch tire? The answer is yes. Frankly, a stock Rubicon on 35’s is pretty much the perfect all around off-road vehicle. Camping, fishing, back road driving, most trails to and from destinations are simply no match for that combination. So why lift it and push it further? If you are truly pondering that question then you don’t understand the disease that is Jeep and the cure that requires bigger and larger vehicles to satisfy a primal urge to drive over things. It took forever to decide on a lift to test and then it took even longer to get it on hand. Between procrastination and life, it then sat in the way for several months. I was starting to consider decorating the boxes for Christmas. Thankfully the schedule opened up, a shop location opened up, and all the parts were on hand at the same time. Big thanks to RnR Auto and Off-Road for space. What did we go with? The JL may be a new platform but some things don’t change. 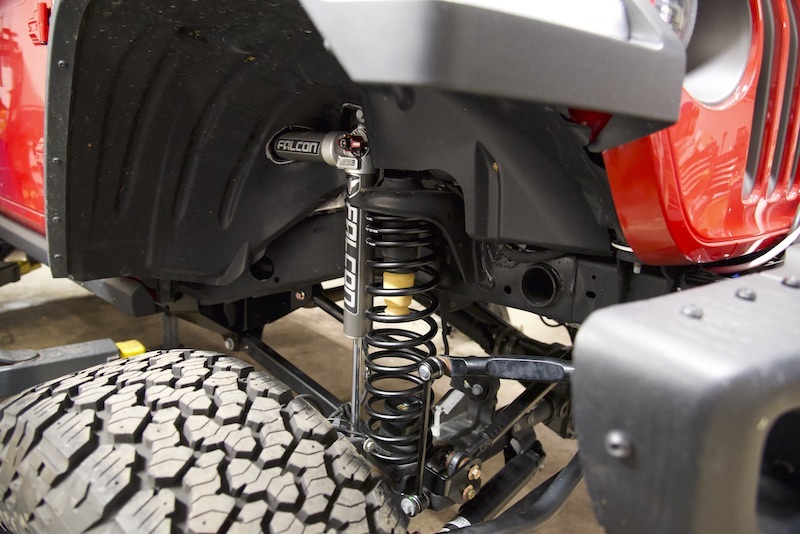 Springs give lift, shocks give control, and geometry makes it all work. 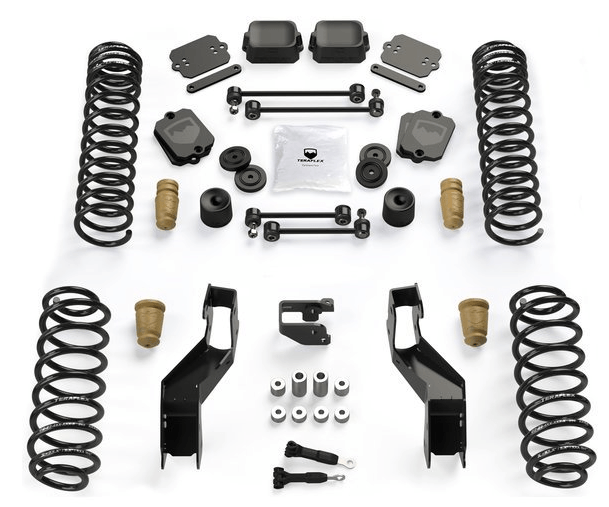 With that in mind, we opted for TeraFlex 3.5 inch lift, Falcon 3.3 shocks, and TeraFlex control arm geometry correction brackets to correct that aforementioned geometry. This same setup is available as a single kit from Quadratec for $2583.99. 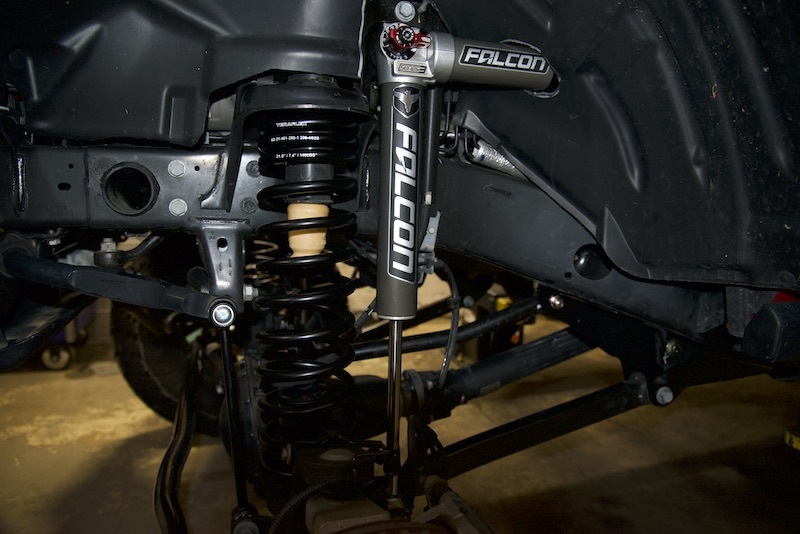 Most of that price is the 3.3 Falcon shocks with the kit retailing for $1063.99. TeraFlex will be bringing their all-new Alpine arm design to this kit, once the arms are officially for sale. We also have the reinforcement brackets to add additional strength to the correction brackets. Install was straightforward and the directions from TeraFlex are spot on. There are only two things that stand out. The spacer in the back of the main correction bracket requires finger gymnastics to get into position, and if you are installing the strengthening kit and the brackets at the same time you have to make sure to tighten the upper correction bracket bolt before putting the plates on. It’s practically impossible to do it after the fact. Well for starters we added the all-new Yokohama X-MT tires on Method Race wheels to start putting some miles on them to see how they perform. Watch for that review in the coming months. With winter right around the corner, the on-road review will include snow feedback right away. We are testing a programmer that offers a ton of custom options, and a recently introduced smaller form factor that makes it even more intriguing. So far it’s worked very well with only a small learning curve. You’ll have to wait to see which one. For now, there are a few pictures above and more on social media. Subscribe, follow, or just check back for more!